This morning, I received a short mail from New Zealand from a lady who landed here after googling for Louis Magee, possibly the most prominent Irish rugby player in the 1900s. Incidentally, Louis Magee was her grandfather... ! Nice story Frederic. There were (to my knowledge) only two tobacco cards featuring Louis Magee (J&F Bell and Wills). I have both and would be pleased to provide scans to his grand daughter if she hasn't seen them before. There's an interesting biography on the back of both but unfortunately one of cards I have has back-damage so it's not readable. Good idea Paul and I would be happy to display your cards here ! Actually, I was about to contact some rugby collectors like yourself… my idea was to ask “visiting contributors” to show on my website 2 or 3 of their preferred postcard, print, trade card etc… + a little comment about it . Do you want to play ? This is an open call to all my readers ! An interesting aside re: Louis Magee....he and his club Bective Rangers get a mention in Ulysess which immortalising both in literature. James Joyce was an avid rugby follower and knew many of the players from Bective Rangers at the turn of the century some of whom he pokes fun at (mention of red-and-green-and white scarf left behind at a well-frequented address in "Monto"). Later in the 1920's while living in Paris he would go to the Fr/Ir games and it was said he could recite the triple crown winning XV from the 1896 era ! Not only a giant of literature but also genuine rugby alickadoo ! Edna > nice input here ! Interesting stuff. Frederic, keep up the good work. I know that there is a huge interest in rugby memorabilia out there. Last aside re: L. Magee....I played myself with Bective with a certain Louis Magee, great-grandson of aforementioned LM. Its possible that I meet him this weekend at Eng V Ire so I will point him here to look up his cousin from New Zealand ! Lous Magee is my great grandad, if you could email any more information about him i.e pictures etc. I would be very grateful. 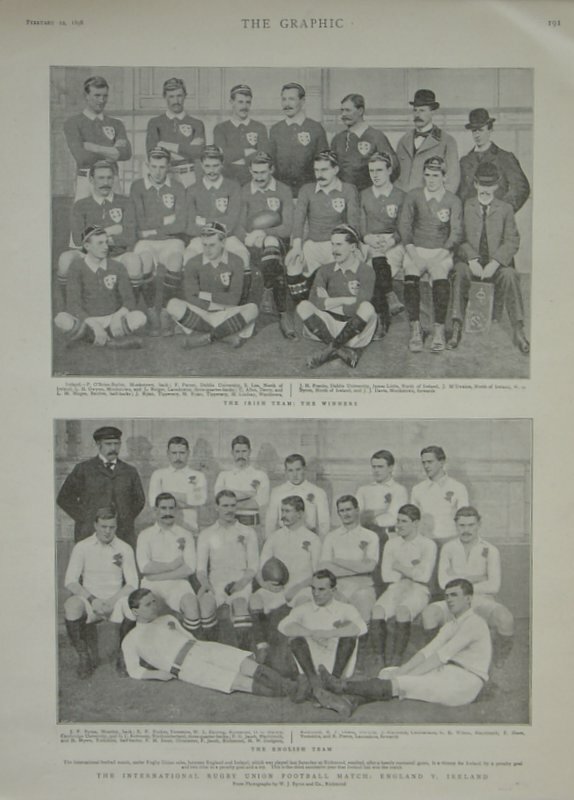 Photo search: French Team vs Bective Rangers, 05 March 1905 at Parc Des Princes. This photo is in a french publication Rugby, Une saison du XV de France page 13 and is produced by Succes Du Livre. We are producing a book for our 125th Anniversary Season, is there anyone who can provide us with the contact details of the owner of the photo as we would like to use it? Louis Magee is my great uncle. My grandfather is Jim Magee one of the famous magee trio. I have some photos of him on his own and with his two brothers. Louis Magee is my Great Grandfather and i am always looking for information and any possible memrobilia on him. Could you point me in the right direction? I'd really appreciate it. Brona Magee was born on 3rd February 1908, the second eldest of a family of fourteen children in Dunboyne in County Meath. Her father, Louis Magee, was the celebrated veterinary surgeon who pioneered a number of equine surgical techniques that revolutionised the horse racing industry and he widely lectured in his field of endeavour. He also captained the Irish International Rugby Team when they won the Triple Crown in 1899. Brona wished to follow in her father’s professional footsteps as a veterinary surgeon and was for a time his assistant in surgical and other procedures. However, it was unheard of for a woman of her generation to do so and she went instead to the world of the white collared worker. She ultimately joined the Irish Sweepstakes, rising at a young age to senior supervisor. She left that in 1942 to take part in the War Effort in London to take employment as administrator in the Heinz Food Corporation. During the Blitz she drove an ambulance in her off duty hours. Her next employment was with the Publishing Industry - The Petroleum Times and survived, until her retirement in this profession, the many takeovers of her firm. During this period she became highly involved in the Meath Association and did tremendous work with Irish emigrants, particularly the poor, the prostitutes and the gay community. She had enormous time for the marginalised and took no prisoners of those that opposed her, landlords numbering among her opponents. She had very wide interests and was an avid sportswoman, being a good tennis player in her day, so much so that when she was a teenager she decoyed the Chief of Staff of the Black and Tans by playing tennis with him on the tennis court at the rear of her father’s house while her father entertained a meeting of the local Republicans in the basement. She met the Black and Tan Chief many years later and took tea with him in the Regent Palace Hotel in London in the 1940s where he had become a resident after he retired and told him the story to a certain amount of chagrin on his part. Brona had enormous compassion for the appalling happenings in the Third World either by way of Genocide, Famine or enslaved conditions and wished that these events would not happen. To achieve this she left virtually her entire estate for the purpose of prevention and relief. It was through the augmenting of her normal income that she managed to create this estate and was gifted by a very shrewd financial discernment in the world of stockbroking. Her augmented income to create this investment came out of her partime return in London to the sale and distribution of Irish Sweepstake tickets. British Law was her enemy on this venture, but curiously British police were her best customers. She did get irretrievably caught on only one occasion and the judge imposed a fine on her because she pleaded guilty against the advice of her policemen customers. Her response was that it got the matter finalised quickly - the Irish Sweeps paid her fine - as she was losing profitable time in further sales and distribution! Thank you Brian. I didnt know about Brona Magee. Are you a member of her family ?